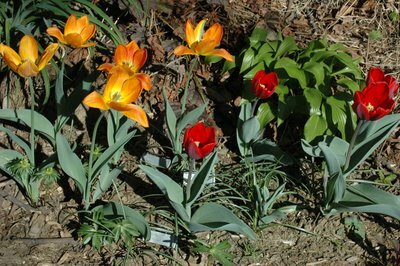 A photo of two heirloom Tulip varieties blooming in the front yard. On the left is the orange "Generaal de Wet", introduced in 1904. On the right is the REALLY red "Couleur Cardinal", introduced in 1845. 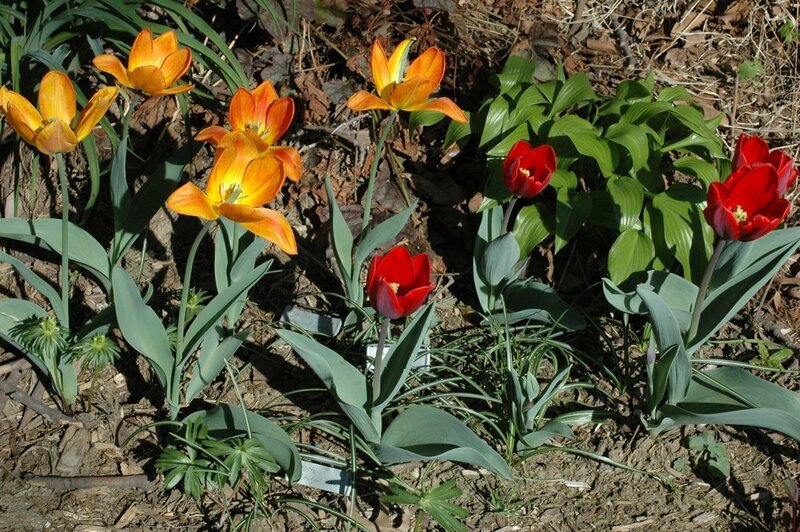 Both are from Old House Gardens, "America’s only mail-order source devoted entirely to heirloom bulbs." It's our first full Spring in our house, in our neighborhood. Trees have been in flower for months now, it seems. Dogwoods are in bloom now. And we're just coming into the riot of forsythia and azalea. There were the first snowdrops, the first crocus, the first signs of irreversible Spring. In our front garden, eranthis, crocus, and now, still, the longest-blooming tulips I've ever seen, heirloom/antique bulbs all. In the back, I want to put a trellis w/porch swing beneath the maple, angled to face back toward the house, and situated for sun in the winter, leafy shade in the summer. The bench will be 6', long enough to stretch out on for a nap. The trellis will be 8', long enough to put the roots of the vines away from the maple's trunk. Beneath the swing, moss and flagstones. Around the maple, moss, ferns and wildflowers. Mature shrubs will block the views out of the garden from this spot, and onto this spot from outside. A sheltered destination. A sanctuary. 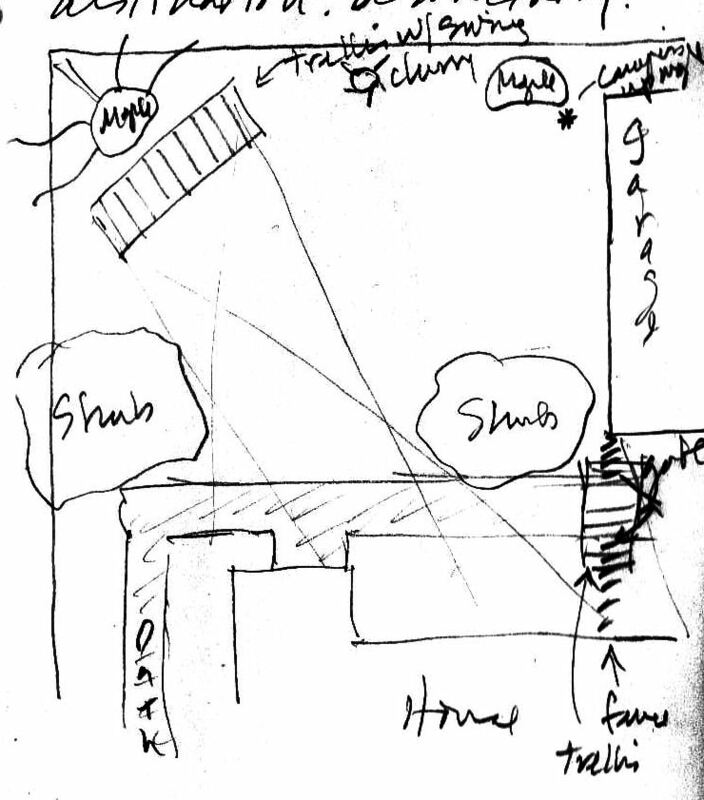 A sketch of the proposed placement of the trellis-swing in the backyard. 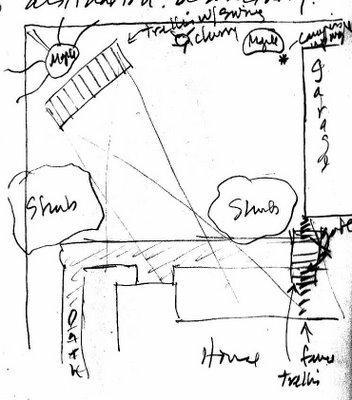 The back of the house faces East; South is to the right in this sketch. The swing will go beneath, in front of, the maple in the northeast corner of the backyard. In summer, when the sun is high, it's shaded by the maple, the cherry tree, and our neighbor's apple tree (not shown in the sketch). This spot is visible from the driveway on the south of the house, and from the street along the north side of the house. Placing two large shrubs will block these lines of sight, providing privacy from without, and enclosing the views from within. The new lines of sight from/to the swing, constrained by the mature shrubs, are shown on the sketch.